Over/Under: Under 159.0 at 1.90 Bet Now! These two sides are in the bottom half of the table but there is still scope for improvement and both of these sides will consider this game as a chance to move up and positively impact on their surroundings. The Istanbul side have lost their two most recent games and currently hold a 4-10 record. However, they have won four out of five at home, so this is likely to provide them with confidence heading into this game. The Germans are 1-6 on the road, which isn’t too good, but they have won three of their four most recent games, moving them to a 5-9 record. This is the first time that these two sides have met and the hosts will be determined to taste victory in this Euroleague clash. 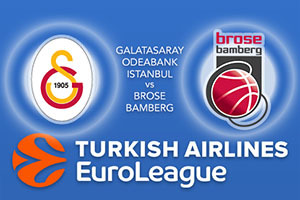 Galatasaray have a number of injury concerns going onto this game and they may be without Emir Preldzic and Austin Daye for this clash. Sinan Guler has been the key man for the Turkish team, offering an average of 11.1 points per game and he is the only available player who has struck double figures for the season so far. Alex Tysu has offered 9.6 points per game, Vladimir Micov has offered an average of 9.8 points per game and Blake Schilb has chipped in with an average of 9.1 points per game. These are the players the home fans will be pinning their hopes on. Bamberg haven’t found life too easy in the Euroleague but they have a couple of players who have been in fantastic form. Nicolo Melli has chipped in with an average of 13.1 points per game while Darius Miller has the same total, so there are players that can make a difference for the Germans. Add in the fact that Janis Strelnieks has provided an average of 10.8 points per game and Fabien Causeur has offered an average of 10.5 points per game and you have a few players that can make a difference. There is even support from Daniel Theis, with an average of 9.3 points per game and Nikos Zisis who has chipped in with an average of 8.1 points per game. Take Galatasaray Odeabank Istanbul at +1 at odds of 1.90 and you can take the Over/Under market by going UNDER 159.0 at odds of 1.90. Bet Now!